I didn’t significantly increase my list of new swimming locations in 2013 and have decided to rectify that in 2014, hence the recent trip to Kilmore Quay and the following weekend when we visited the valley of Glendalough in the Wicklow mountains. 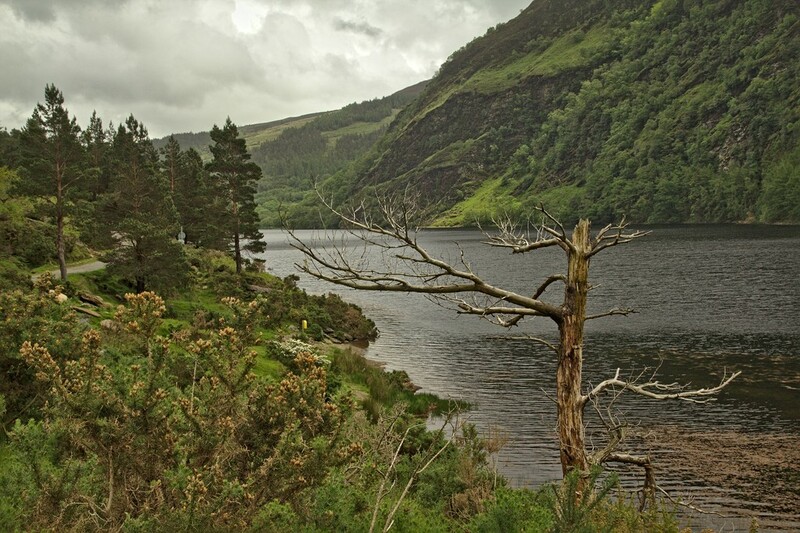 Situated in the Wicklow National Park, Glendalough is one of the scenic jewels of Ireland and one of the most popular international tourist destinations in the country. It’s the site of one of the most important and beautiful Irish monastic settlements, which was founded in the sixth century. The name means the glen or valley of the two lakes. The lower lake is only a few hundred metres long and surrounded by reeds, and holds little or no attraction for a swimmer. The Upper Lake is a fraction under one and half kilometres long and enclosed by the steep high tree-covered valley sides, reaching in toward the foot of the river flowing down off the waterfalls at the head of the glacial valley. 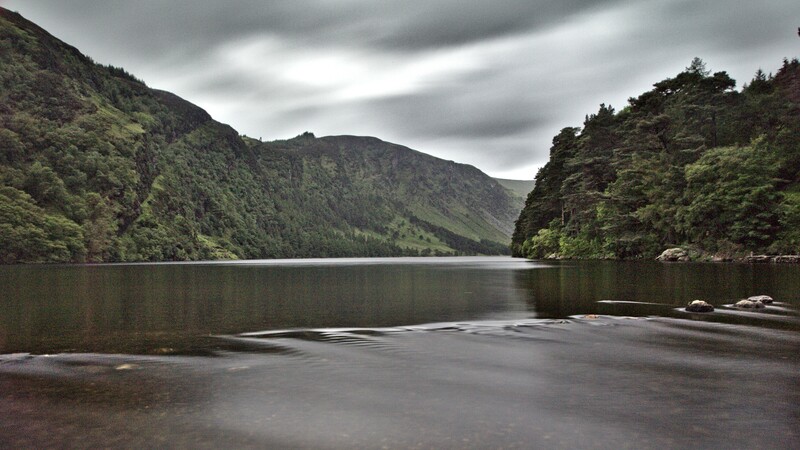 Unlike the lower lake, indeed, like most lakes as far as I am concerned, which I find to be dull, unexciting and uninspiring, Glendalough draws one in and begs to be swum. I’ve been in Glendalough a few times this year and last and planned to return to swim the lake, so finally one recent dull summer Sunday morning, just two days after swimming in Owen’s Martin Duggan Memorial in the Blackwater in Fermoy, off we set. As we descended the last few miles as we crossed over the Wicklow Gap mountain pass above the valley the intermittent thunder showers became increasingly heavy and when at mid-day we pulled into the furthest-in car park nearest the Upper Lake, we couldn’t even leave the car for 15 minutes, so heavy was the deluge. At least the thunderstorms would reduce the numbers of tourists willing to walk the mile or so from the main site up to the lake. And down at the lake edge, there was almost no-one around, despite the thousands of tourist in the locale. (Apparently, much of a recent TV drama series called The Viking is filmed around this end of the lake. This is mildly ironic as the central feature of the Glendalough area is a Round Tower used to protect the monks from Viking attack). The lake runs eat to west through the valley, the water black like most Irish mountain lakes and the steep sides protect it from wind. It’s no more than a couple of hundred metres at the widest part, and gradually tapers westward. It drains via a narrow river in the north-east corner, and there’s a pebble beach that runs along the eastern end for hundred and fifty metres or so with the long of so metres. I did quick temperature check (mmm, 13 degrees Celsius, lovely) then changed in the rain, stuffing my clothes into the box and David Dammerman’s camera into my Speedoes. As I put my ear plugs in, the rain stopped and suddenly we could see sunlight pouring over the high southern rim of the valley wall, down over the trees climbing the sides, and out onto the lake. Having earlier checked the lake length on Google Earth, I gave Dee my estimated time and strode into thigh deep water before diving in. (Apparently the doglet, who dislikes the sea and waves, hurled himself into the freshwater behind me, but quickly ran out of steam. I really need to put a swim training plan together for him). Two strokes and the bottom suddenly disappeared as I passed over the steep drop off and out into the black water, which those who’ve never swum in lake with peat run-off can find quite intimidating. 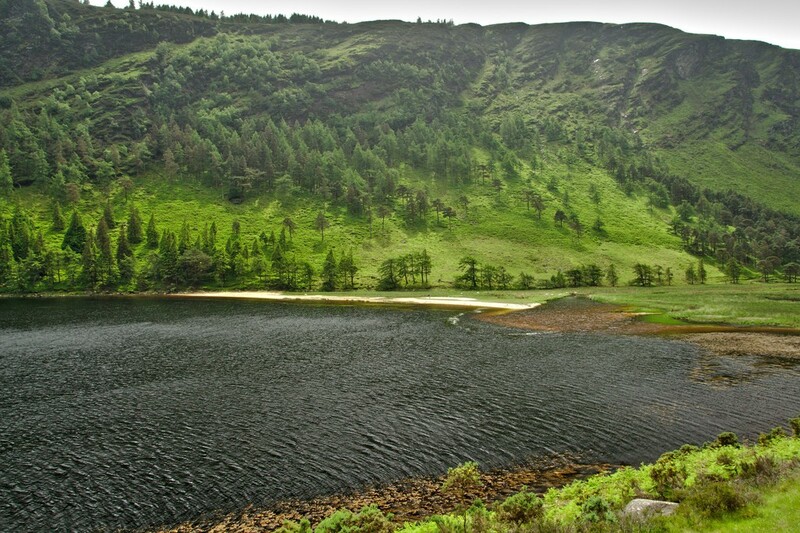 Peat run-off in glacial lakes is often black or, as is the case in Glendalough, a rich amber like good Irish whiskey. The amber colour allows a swimmer to see their hands and feet or another nearby swimmer, like a sepia photograph. At four or five metres distance though it swallows light. Beneath is a pitch blackness like you never experience in the sea which will always have tones of green or grey and the sea at night will have some bioluminescence. A peat lake is a complete unvarying blackness, reaching into the depths under you. Or is the reaching out of the depths toward you? The Sun had briefly appeared as I dove in, but then slipped in and out of clouds as I progressed down the lake. I stopped briefly about half way to take a few photos, though few were of value. For someone used to the complete control of a DSLR camera, the restrictions of a point and click, combined with shooting in the water which restricts angle and often coats the lens with water, means that more often than not I can’t capture things as I would on land. Unfortunately the water and Sun combined forces against me. I headed for the far (west) end. As I neared, the trees on the right-hand north bank thinned, and I realised that a path had winded down the length of the lake. The water temperature dropped suddenly by a degree or more but within a dozen strokes I impacted a sand bank that rose from the deep, and I was forced to stand. Later when we walked in the path by the lake, I saw that I’d hit the silt bank that formed around the entrance of the river down from the waterfall into the lake. It had taken 30 minutes to swim the lake, which was far longer than a 1500 metre swim should have taken, even with a stop, so I guessed I must have read the map incorrectly. A few photos at the turn and I started back. As I traveled up the lake, to add to the entertainment, I decided to deliberately try to give myself the heebeejeebies and summoned some of my favourite water monsters from the pitch blackness beneath for some brief company. The one which I enjoyed the most was just a giant iris and pupil, which filled the lake underneath, visible to none but me, and I just a mote, swimming over the eye. 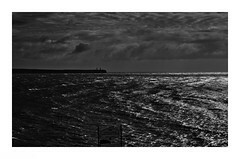 Soon, the eye have blinked itself back into blackness, I closed in on the eastern departure beach. I had returned in ten minutes less, so despite the calm surface, the very shallow river draining the lake has added a not-insignificant current flowing eastward. 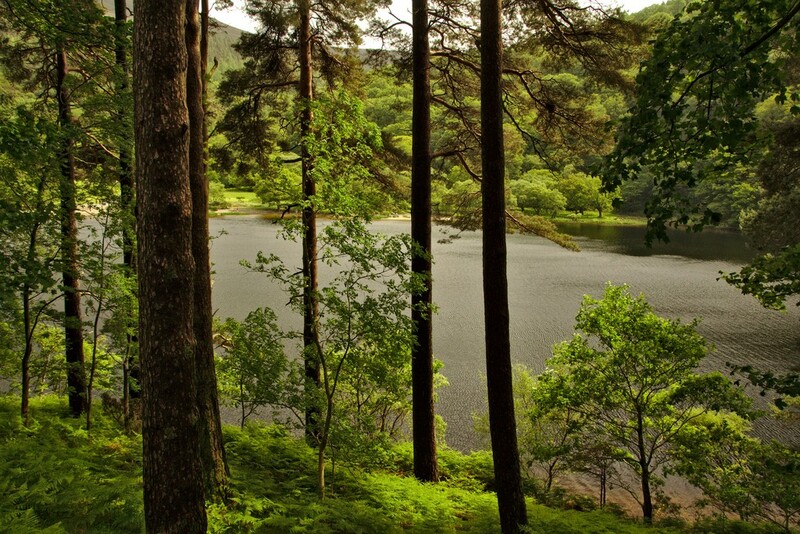 Glendalough is a spectacular location for a short swim that avoids the boring nature of most lakes. Thanks for advice on Gels LS – I would imagine that stopping to ingest would probably be counter productive as I would find it hard to ramp up again after stopping. I hear you on the hydration – but I try to dump the litres in on the day before. What about that Skellig swim? Is there anybody organising one for this year?? I know the organiser, if I hear from him that it’s on this year, I’ll check & let you know. I somehow don’t think it will be though as the Beginish swim is back this year. I love that you consciously summon “the monsters” in your mind! What a delightfully creepy passage. I guess in that way you embrace and conquer your “fears” at once. Lovely!!! Hah – lep in and f*** the begrudgers – a sentiment worth of Behan himself (a mean swimmer by all accounts). Do you know what – I just might take a trip up there this summer and give it a go. Garnish was fantastic – was genuinely worried about my ability to make the trip (only 12 months into this and still building stamina and confidence) but the relaxed vibe that Ossi has instilled and the amazing weather made it very easy. I learned a lot as well – just about preparing for a race – downed gallons of water the day before etc – and warming up properly and getting there nice and early so you are not rushing to get your kit together etc. All basic stuff but it’s a steep learning curve when you are a novice. My familiarity with the place probably helped too – going there since I was a bairn. I also managed to cut a few corners, which probably helped (!) but it was def my longest ever swim and it’s good to know I can handle 1.40+ of non-stop swimming. Saw a few people had gels stuffed in suits etc – might try those. Heading to Croatia for a week of swim camp on Saturday (with Strel – the nutty Big River Man people) where I am hoping to get a bit of help with technique and then onto Lee Swim and def the Sandycove Island race. What is really driving me though is something I’ve wanted to do since I was a kid. Hoping in August to swim from Barleycove Beach, out into the bay (under Mizen Head) around Devil’s Rock, and back to the beach. I know it has been done by a good few people – there was actually an organised race there a few years back, But I know if I can manage that, I would be a very happy man. Doing the Garnish has really given me the confidence to plan that next step. After that – my ULTIMATE Irish swim would have to be around Skelig Michael – very jealous that you have gone around that. How would a man go about getting that swim done??? You really don’t need gels for 5k or less than 2hrs of swimming. Assuming you’ve eaten normally in the days beforehand and trained a lot (more than say 35k), then you have sufficient energy (glycogen) for well over 2 hours intensive swimming. I’d only feed for swims over 2.5 hours. Also, I don’t know if you wear a wetsuit, but if so, don’t take too much water. Dehydration isn’t going to be a problem in water under 22 to 24, but if your wear a wetsuit & drink too much you can increase the likelihood of other problems. Interesting article. My only real fresh water swimming experience was last year’s Lee Swim (loved it, doing it again next month) and the buoyancy difference to the sea was really marked. I felt like the river was much less ‘supportive’ and that I had to work a lot harder to stay on top. Was this my imagination or is there a big difference between salt and fresh. How did Garnish go for you? It was a great race, I got to use almost all my bag of race tricks, had a good result. Yes, salt is far more buoyant than fresh water. You are about 3% more buoyant in the water around Ireland. Doesn’t sound like much, but you’ve noticed the difference.The longest I’ve swum in fresh water (Iniscarra in Cork) was six hours and my shoulders felt like I’d done 10 hours. I have a lot of respect for swimmer’s like Sarah Thomas doing 12 hours or greater in fresh water. 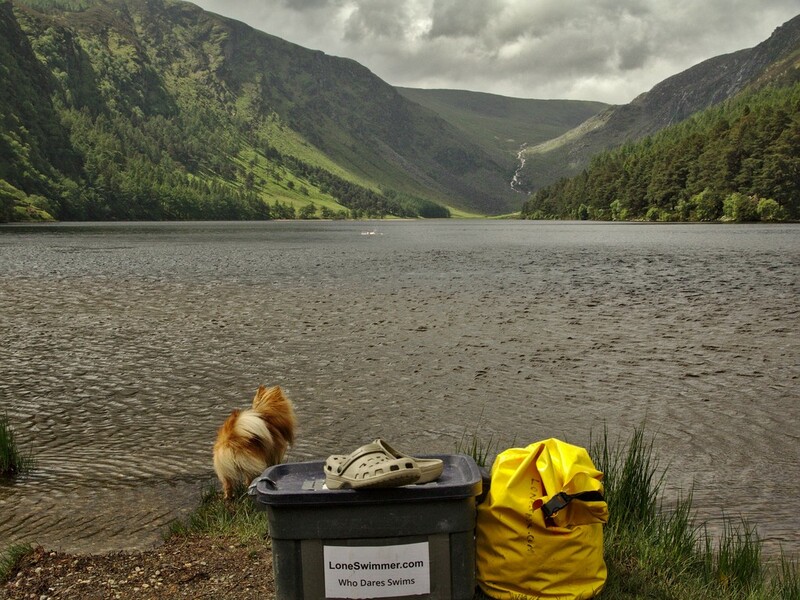 As for swimming Glendalough, I don’t give any weight to issues like that. Yes, i just jumped in. The tourists who were there when I exited were very entertained. But I’m not doing any environmental harm, I’m just enjoying the location in a different way to the majority. I mean what are they going to do? Swim out and fine me? I didn’t see any No Swimming signs, though there are warnings of the steep drop-off and submerged obstacles. Water belongs to all of us, and as I wrote the first day of this blog, open water swimming is an expression of individual freedom. Be free!